Please refer to our stock # FenRGslipr when inquiring. 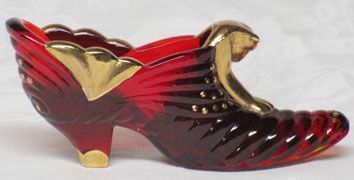 Fenton Red Slipper with Gold hand printed Decoration is a must have! All the gold is in mint condition -- as is the glass slipper. Signed by Randy Fenton. And also, artist signed by D. Olsten. It measure 6" long and about 2.75" high.